Vines Art Festival, Vancouver’s unique multidisciplinary eco-arts festival, features over 70 performing and visual artists at parks throughout Vancouver: Trout Lake Park, Kitsilano Beach, CRAB Park, Granville Island, Roundhouse Community Centre, and Strathcona Park – August 8th-19th, with the main event at Trout Lake Park on August 18th. In its fourth year, this 100% free, all-ages, event joins activism with the arts, not to mention it’s fun, interactive and celebratory! Our featured artist duo is the Resilient Roots emerging artist, Jaz Whitford, spoken word performer from the Secwepemc Peoples, and Award Winning musician Sandy Scofield, who is Métis of Saulteaux and Cree Nations. The line up of the Resilient Roots program includes Alex Taylor McCallum with mentor Nikki Ermineskin, Jaye Simpson with mentor Edzi’u, Jaz Whitford with mentor Sandy Scofield, Mitcholos Touchie with mentor Jonina Kirton, Valeen Jules with mentor Rosemary Georgeson, and Crystal Smith with mentor Ronnie Dean Harris. Jaz is an anti-professional, working as a street musician, slam poet with a focus on decolonization and indigenous autonomy. they are a defender of the sacred and use their craft as a tool to decolonization and land sovereignty. they reside as a guest on unceded and ancestral territories of the xʷməθkʷəy̓əm (Musqueam), səl̓ilwətaɁɬ (Tsleil-waututh), and sḵwx̱wú7mesh (Squamish) First Nation peoples, otherwise and colonially known as Vancouver. they and their fire are from the Secwepemc nation of the south central interior. Jaz in the recording session with mentor Sandy Scofield in preparation for their first album to be released at Vines Festival 2018. Sandy Scofield is a multi-award winning composer, musician and singer. She has studied classical, jazz, African, Indonesian gamelan and electro-acoustic music. A Métis from the Saulteaux and Cree Nations, she hails from four generations of fiddlers, singers and musicians. Among her four recordings to date, she has won five Canadian Aboriginal Music Awards, a Canadian Folk Music Award, an Indian Summer Music Award (U.S.A.), a Western Canadian Music Award and received three consecutive Juno nominations. 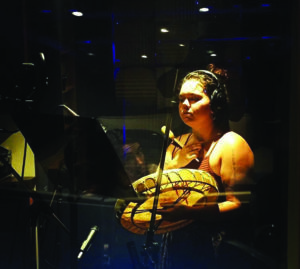 Over the years, she has mentored innumerable First Nations singers and songwriters in the way of rudimentary music theory, vocal techniques, songwriting craft and music-industry protocol. She has toured to festivals on five continents with the the International Rainforest World Music Festival in Borneo, 2011 making the fifth. She has composed for dance, film, television and theatre, with the Aboriginal Welcoming Song for the 2010 Olympic Opening Ceremonies, the highlight to date. 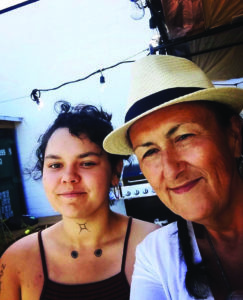 Sandy Scofield highlights that the mentor relationship is that of historical cultural practices of passing down knowledge in generations, is elated to be sharing studio time in this mentorship, and is proud of how gifted Jaz already is!